Lukas Wezel is a multi-disciplinary Graphic-Designer, who works with scenography, typography, corporate identity, art direction, promotional photography, logo design, layout, illustration, web design and interactive design. • 2009—2012 Studied communication design at the University of Applied Sciences, Mainz, Germany. 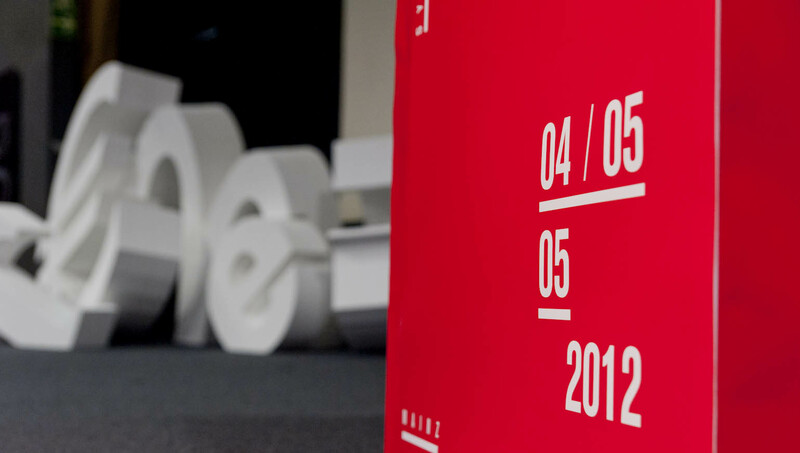 • 2012–2013 internship at the Design Agency »hauserlacour« in Frankfurt. • 2013 Graduation with Bachelor of Arts at the University of Applied Sciences, Mainz, Germany. • since 2013 Master study at the University of Applied Sciences, Mainz, Germany. Communication, participation, identification – the WE MACHINE. 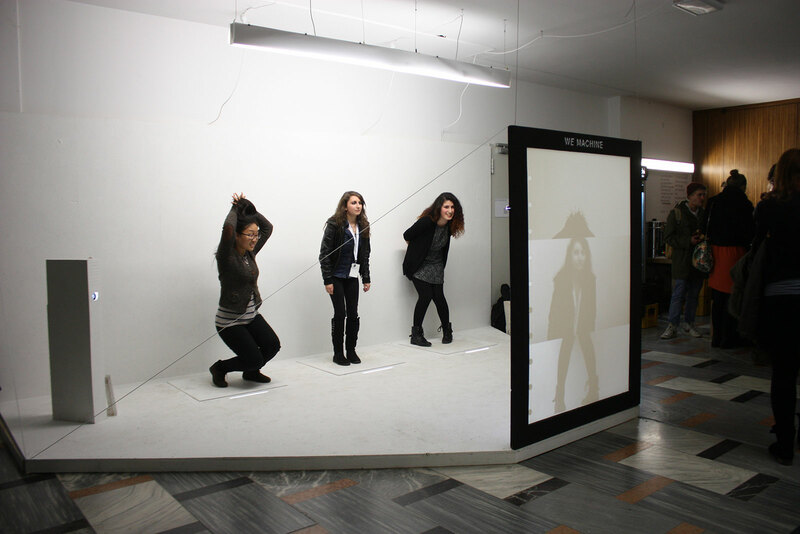 The WE MACHINE combines three people into one photo-sculpture in real-time. The result is a live-collage that can be actively shaped by the participants. The machine records each one of three participants at a time by webcam and then combines this into an overall result. Each camera takes a different section of the human body, the three parts are feet, torso and head. As soon as there are three people in the right place, there is a 15-second-countdown starting and the participants are getting the chance to position themselves before an image is triggered. 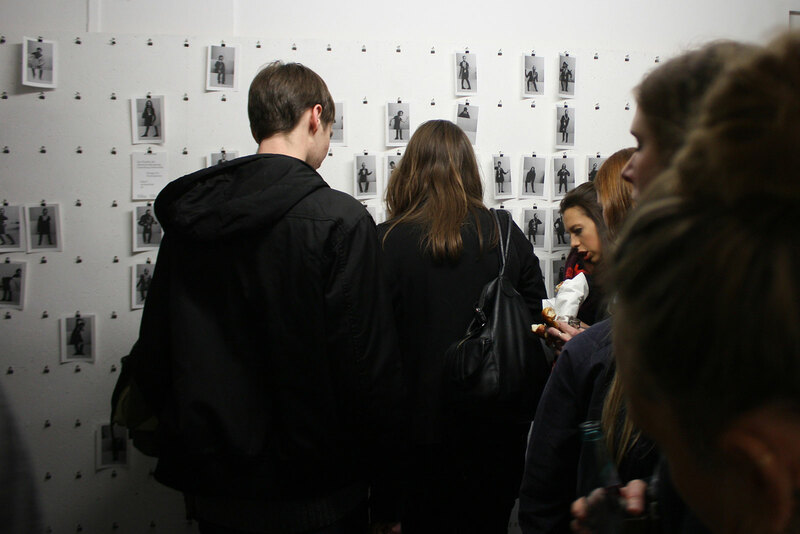 The whole time the contributors can watch themselves on the screen in the center of the installation, so that they can determine the final look of the collage. The final result is automatically forwarded to a printer just after the release. On the “wall of fame“ all printouts can be positioned and be presented to everyone passing by. In addition, each participant receives a hard copy for themselves as a souvenir. The spacial pattern is an open arrangement, centered to the main point, the screen with the unobtrusive integrated cameras. The screen is two-sided, so the picture is to be seen from every angle. The wall of fame and the background are arranged slightly asymmetrical right and left to the screen. The triggers are embedded in a platform that visitors have to step on – they must enter the machine. The whole installation is white and scenographic style. Only the screen in the center stands out from the rest by a black frame wich draws the attention to it. Call for Type. New Typefaces. Gutenberg-Museum, Room for special exhibitions. Conception, design and production in cooperation with Simon Störk. New software programmes and distribution channels have fundamentally changed the design of typefaces. They have led to an enormous increase in typeface production, which, however, can also be confusing. While there was a production of only a few hundred typefaces in the 1970s, you can choose among ten thousand fonts today – and there is an upward trend. Each development of type is a search for a specific conveyance of messages and intentions (it does not matter whether only a cut or a comprehensive type family is referred to). Many display fonts represent individual, artistic ways of expression. But some of the designs also focus on particular questions like those of legibility, simplicity, and functionality. In addition to that, a high degree of expressive independence can be the driving force for their creation. So the reflection on written text beyond the alphabet is an essential motivation presenting itself with fonts that show the nature of sign systems. It becomes clearly apparent that a young type design scene has recently begun to establish itself. These type designers, who have a perfectly functioning network, strive for more than individual design experiments or a trendy «hype». So it is with serious enthusiasm that these young designers develop body copy fonts or rework historical typefaces. – They aim at fundamental statements, and by the use of these they want to gain professionalism in their field under new technical and aesthetic conditions. 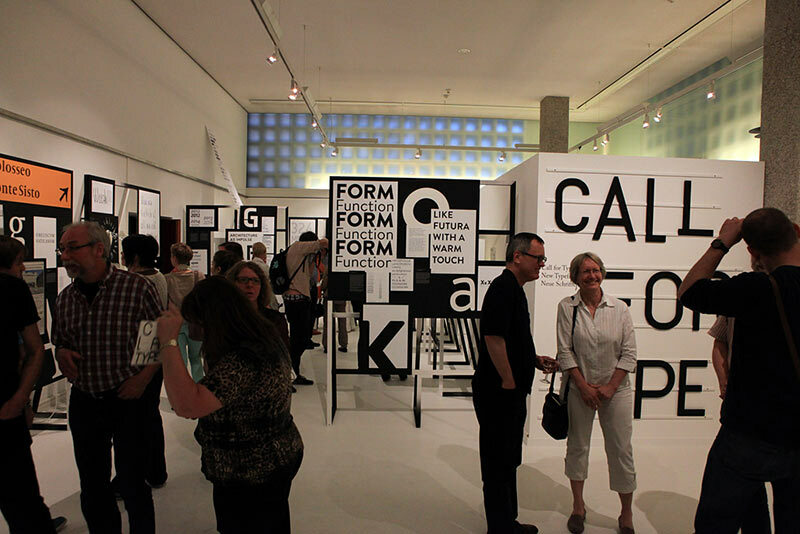 During the preparatory stage of the exhibition, the «Open Call for Type» calls on young – lesser-known – font designers to make an application by submitting their typeface designs. A judging panel will then choose the most interesting designs which will also be exhibited in the exhibition «Call for Type». 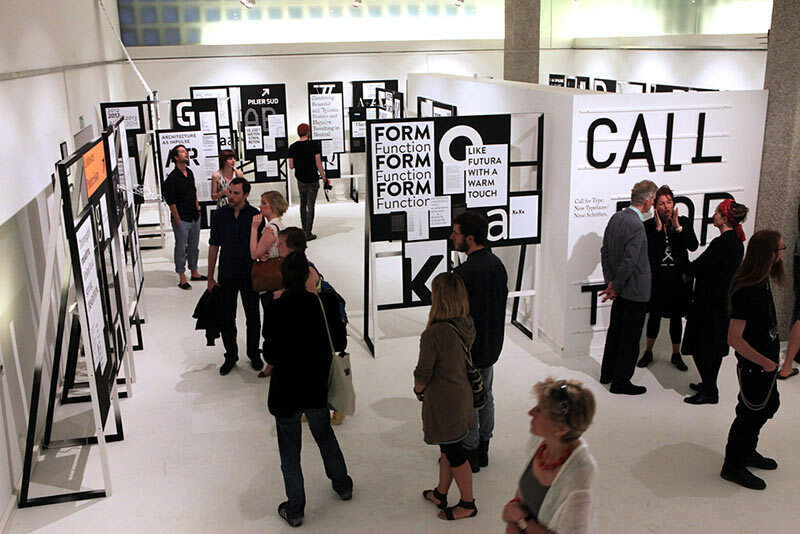 The project «Call for Type» delivers insight into the new world of type design. It presents, in words and pictures, a time-related compilation of current positions in the field of font design. Especially eye-catching fonts are not only displayed, but also rounded off by the statements of young font designers. So these exhibits can also provide an opportunity for further reflection and discussion. 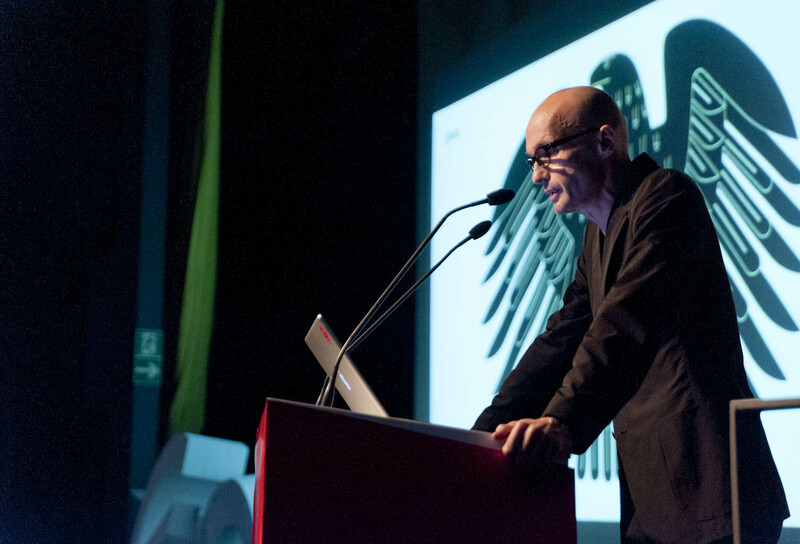 Corporate Identity, Videos and Stage setting of the Symposium in cooperation with Simon Störk. Nach den politischen Dimensionen von Typografie fragt ein Typo-Symposium am 04. und 05. Mai im Gutenberg-Museum Mainz: Kann die Wahl einer bestimmten Schrift politische und weltanschauliche Implikationen beinhalten? Können bestimmte Schriftsysteme und Logotypes als Manifestationen von Macht begriffen werden? Welche Diskurse und Überlegungen stehen hinter bestimmten Schriften? Und: Wie und warum kann sich konventionelle Typografie in eine subversive Geste verwandeln? Namhafte Expertinnen und Experten aus Theorie und Praxis werden zu diesen und anderen Fragen kritisch Stellung beziehen und ihre Standpunkte verdeutlichen. Fünfte Jahrestagung der Gesellschaft für Designgeschichte e.V. im Gutenberg-Museum Mainz. Schrift begegnet uns überall. Beim Lesen eines Zeitungsartikels, eines Romans oder eines Straßenschildes konzentrieren wir uns auf den Inhalt, ohne die Buchstaben und Zeichen bewusst wahrzunehmen. Schrift transportiert in erster Linie Inhalte, Buchstaben sind aber auch visuelle Zeichen. So können Typografinnen und Typografen heute selbstverständlich davon ausgehen, dass die Wahl einer Schrift auch den Charakter eines Textes und damit einen Teil seiner Aussage mitgestaltet. Dass Typografie keinesfalls neutral ist, verdeutlicht vor allem die machtpolitische Instrumentalisierung von Schrift, gerade in Deutschland: Wie ein tiefer Riss zog sich der Streit zwischen Fraktur und Antiqua bis weit ins 20. Jahrhundert, und bekanntlich wurde die Typografie auch von den Nationalsozialisten ideologisch aufgeladen. Heute manifestiert jede Wortmarke, die durch eine bestimmte Schrift ihren ganz eigenen Charakter erhält, das Wechselspiel zwischen Schrift und Macht, indem bestimmte Schriften unweigerlich die dazugehörigen Imaginationswelten evozieren. Aber auch die Kommunikationsguerilla begreift das Spiel mit großen Schrifttraditionen und/oder Logos als subversiven Kommentar zu Macht und Freiheit. Oder: Wer bestimmt die Schrift? Wie spricht der Staat mit seinen Bürgern? Welche Botschaften tragen wir auf der Haut? Wer führt den Diskurs über Typografie? Wer erinnert vergessene Sprachen und Schriftsysteme? Wem gehört das digitale Wort? Wie kommuniziert eine globalisierte Welt?